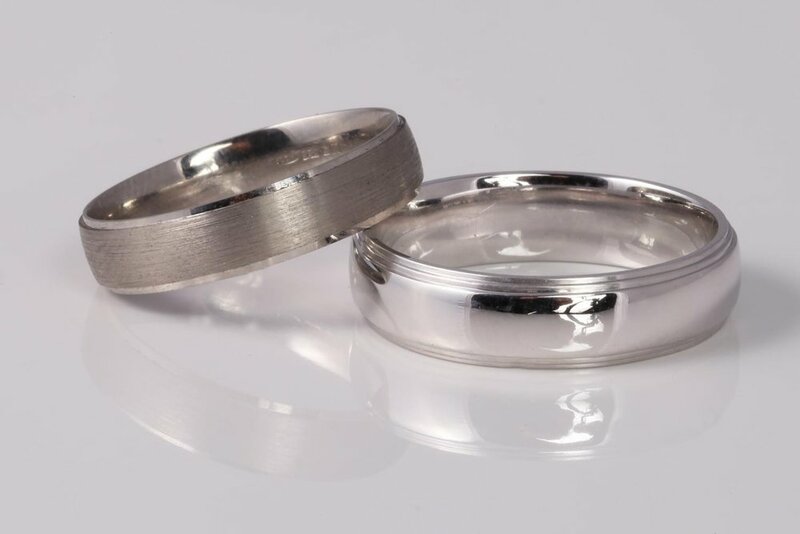 Men's wedding rings can be the dullest of affairs - Some guys want a plain wedding band and that's fine but, so often they don't have a choice not to. Guys often say to me that they want classic look but with a little twist. The wedding band is a key piece of jewellery worn by men and in my opinion it should reflect thier personality. Creating a custom ring allows you to express your design flair wheather that's very geometric pattern or a more organic look, any look can be catered for. Below I've created a look book of some of my favourite gentlemens wedding bands, Maybe it will get the creative juices flowing for what could be done with yours. 1) A classic look, with a hammered effect running around the outside of the band. This just adds a little interest and breaks up the light giving a really lovely effect. We can do all manor of Hammered effects depending in on what you have in mind. These can also be coupled with different finishes and even mixed metal bands. To come up with a wedding band, which is truly unique. 2) Another great choice when customising your wedding band is using two contrasting coloured metals. This can tie your wedding ring into your Fiancees or develop a unique look. Below we used yellow and white gold, high polishing the white gold and matt brushing the yellow gold to accentuate the different colours. We also used small grooves between the metal to make the white gold stand out even more. 3) Engraving is another technique that can give a truly unique finish. Below we engraved a pattern that was similar to my clients Grandfather's shotgun. I thought it was a really lovely way to link the generations and to marry the classic scroll engraving into the more modern setting of a wedding band. We also opted of a slight concave to the outside edge of the ring so it had a little shape to the wedding band. If you're an artist or graphic designer you could always create a pattern that can be engraved onto the inside or outside of your wedding band. 4) Sandblasting can be applied to any metal and even used in areas of the ring design. Here we have paired sandblasted the main body of the ring with fluid edges which were high polished help emphasise the contrast in the ring. 5) Fluting the edges can really help give a little extra detail to the very edge of the design. This can be done using a single, double or even flue. Or go the whole hog and ridge the whole outside surface. 6) last but by no means least we have my choice of wedding band. I wanted to have a diamond set band but I really didn't want it too in your face or tacky. To achieve this look I used the trillion cut diamond. These were set full eternity ring, I left some platinum between the diamonds as I wanted the stones to be a detail that was noticed at a second glance, rather than the main event. On the inside I used a very geometric pattern for the back holes which I felt was in keeping with my branding and the engraving that I was planning to put inside. On My wife's ring we put a sapphire on the inside of her wedding band but this is a subtle way of adding a little bling. If you wanted to echo your wife's ring on the inside of your wedding band this could be a great way to do this. I hope these ideas help with designing your perfect gents wedding ring. If you have an idea but are not sure it'll work, please get in touch, we'd be happy to advise you on it.